The modern enterprise "Metallodetal-S" offers carrying out coordinate and boring works of any level of complexity. Availability of the latest equipment assumes high-precision calculations and high-quality implementation of orders which will provide further high-quality operation of the made products. Standard machining of metal and machine equipment does not give opportunities of ultraprecise production, and is expected more likely serial release. Processing of the body or production of any part it has to be carried out strictly on measurements and drawings, and well trained professional as availability of machines demands number of the experienced specialist should carry out function. The choice of auxiliary tables on which it is necessary to make its processing depends on design of this or that part. Boring works can be performed on horizontal not rotary table, others demand obligatory use of horizontal rotary table, and some cannot be processed if there is no universal and rotary table. Having the extensive machinery equipment allowing to carry out different configurations of products the enterprise guarantees that processing of parts on boring machines will be executed most precisely and in short time. The trained worker who has extensive experience will see off them and repeatedly performs coordinate and boring works. The main destination of this kind of the equipment is processing of case shaped parts and devices if main goal is the symmetric arrangement of the received openings. In total they can be considered as completion phase of processing of elements and products, terminal point of milling and drilling. However works on koordinatno boring machine assume commission of absolutely accurate operations expected that processing of the body of reducer, end faces in grooves, frezerovochny works under certain corner and cutting conic openings will be executed. Therefore, coordinate and boring works on metal - the labor-intensive process taking the long period of time (especially in comparison with standard milling), but are much higher on degree of quality and accuracy of execution. Mills make processing of the body of reducer, flat and curvilinear surfaces, various grooves, grooves, slits, teeths of gear wheels, threads and many other things. Almost any part of the modern machine passes several milling operations. Processing of case shaped parts depends on providing exact relative positioning of the processed planes. Almost minimum deviations of relative positioning of flat surfaces at milling processing in size approximately same, as well as form errors. 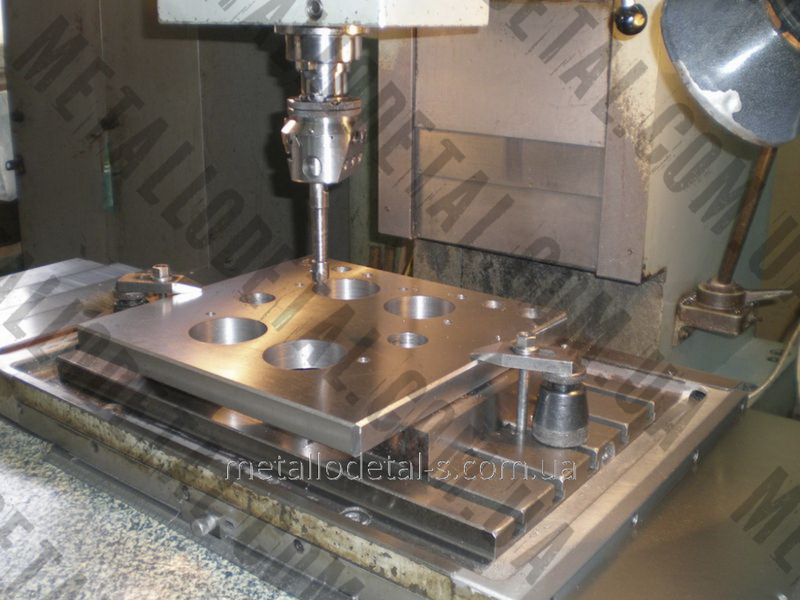 Metal machining by cutting depends on their chemical composition, structure, mechanical and physical properties. The cutting mode for each technology operation is calculated and set by technologists. But in the conditions of small-scale production or when processing of case shaped parts of single quantity is made - the milling-machine operator often should most choose the most rational modes of cutting. Skilled workers do it on the basis of own experience, without predesigns. Boring works, often, consist in performance of parts of different form and from material of different hardness. For increase in productivity coordinate boring machines are supplied with cutters with plates from firm alloys. Boring works demand expense considerable part of time of the borer for check and installation of part on the machine on the available reference planes, openings of table, combination of middle lines. Boring processing assumes carrying out certain sort of actions in openings which have been executed by molding or drilling, for achievement or precisely designated diameter and direct increase in the sizes. Besides machining of metal by erasure of the available roughnesses and grinding of surface of part is made. Boring of parts and processing of the body happens at slow rotation of the machine. Such approach allows to increase execution accuracy to 0,005 mm. drilling and performance of its boring. checkpoints - for performance of through holes. boring of case shaped parts, elements of openings and which axes are placed in polar system of coordinates. Such type of the machine equipment has available optical devices which give the chance to count the whole and fractional parts of future coordinate size. At optimal operational conditions coordinate and boring works on metal and processing of case shaped parts are carried out with observance of center to center of 0,004 mm (rectangular system of coordinates), and also indicator of 5 angular seconds (polar system). Such digits maximum, considering standard indicators in 0,006 mm and stable decrease in clearness of lines and edges. Installation of axis of opening which is executed on element or the most finished product requires movement of table or skids. They, in turn, accommodate on special ruler. It can be both stationary and to be located on bed, and mobile or mobile, and then it is placed on table. Besides boring works to chp are controlled by optic instruments which allow to expose parameters once and further to chisel several parts. Errors at the same time are excluded completely. Machining of metal on available the equipment of the Metallodetal-S enterprise allow to provide services of boring of different configurations and with use of any sizes of parts. Such boring to order will give opportunity of complete control of production and confidence that behind the machine the professional of the business will work. It will most precisely execute all measurements and will establish exact digits of future openings and edges. "Metallodetal-S" guarantees that the price of boring will be the lowest, however at the same time quality considerably will please clients.